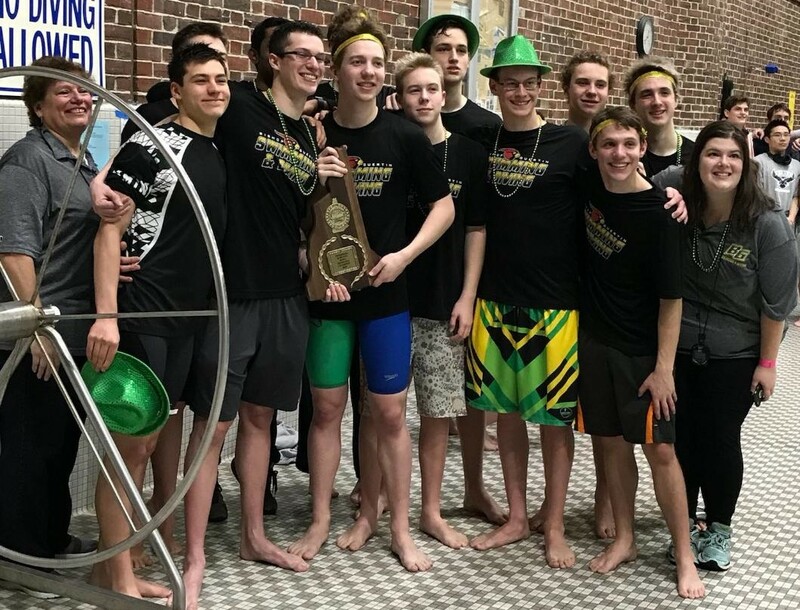 Courtesy photo The Bishop Guertin boys swim team is heavily favored Saturday to repeat this scene from last year when the Cards celebrated their Division I championship. A pool repeat would be sweet. That’s what they’re thinking at Bishop Guertin and Alvirne High School. The Cardinal boys swim team is the favorite going into this weekend’s Division I Meet at the University of New Hampshire’s Swasey Pool to repeat as state champions. On an indivdual basis, so too is Alvirne High School diver Skyler Bomba. Except for Bomba it wouldn’t be a repeat, it would be a threepeat as she won the title in 2017 and last year. Things get underway with diving for all divisions later today at 5:30 p.m. The senior Bomba is seeded first in Division I girls one meter diving, and will face competition from No. 2 seed junior Bronco teammate Brittney Whiting. 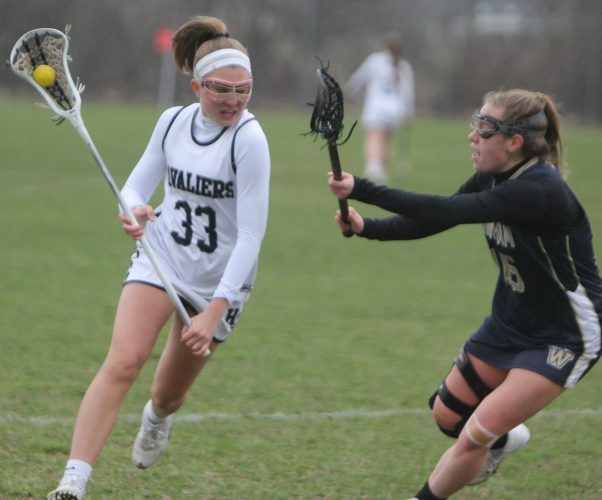 Bishop Guertin freshman Moira Thompson and Nashua South freshman Sue Mai White round out an all-local field at Nos. 3 and 4, respectively. In the Division I boys diving, Nashua North’s James Bolton hopes to improve on his sixth seeding. There are no locals in Division II diving. 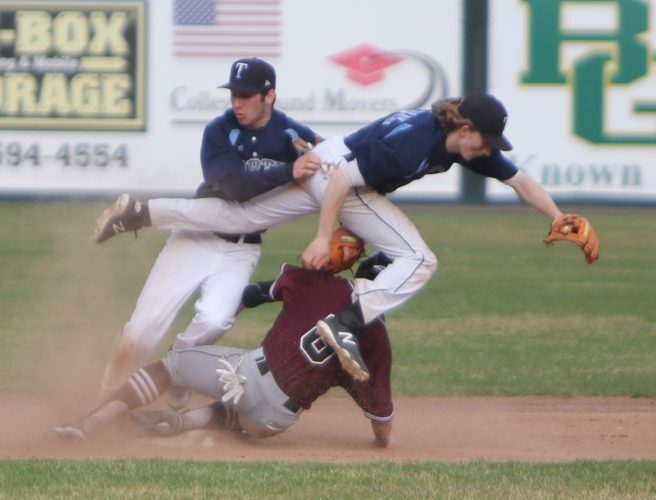 Actually, the diving may impact Bishop Guertin’s chances, as Exeter has four divers competing Friday that could give the Blue Hawks valuable points and a head start going into Saturday. Still, it would be hard to envision BG not winning its second straight title, if the seedings are any indication. The Cards have an incredible 11 No. 1 seeds, including the 200 medley, 200 free, and 400 free relays. 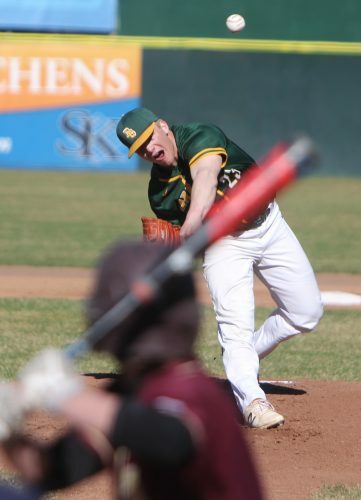 The key names for Guertin are seniors Matthew Lashua, John Puksta, Aidan Daudier, Matthew Rantala, junior Conner Donoghue and sophomores Jack Januario, Ivan Dodor and Matthew Crane. Lashua is seeded first in the 200 yard freestyle, while Daudier and Connor Donoghue is No. 1 in the 200 IM. Crane goes in as the top seed in the 50 free, Rantala in the 100 butterfly, Puksta and Crane are one-two in the 100 freestyle, Januario tops in the 500 free and 100 back, and Dodor-Puksta one-two in the 100 breast. “They have worked hard all season and as a team their goal is to try and win every event, except for diving,” Rousseau said. Other locals to watch in Division I boys’ various events are Merrimack’s Tobin Stevens and Evan Whaley, and Nashua North’s Mario Rodriguez and Sayan Ghose, Nashua South’s Jason Lam,and Alvirne’s Murray Reynolds and Parker Hilton. In the girls meet, Exeter and Bedford are expected to go at it for the title, and third place is up in the air. It’s more of an individual showing locally. Guertin will look to improve from last year’s eighth place finish, keyed by junior exchange student Wilma Johansson, sophomores Olivia Shusta, Grace Wang, Michaela DosSantos and freshman Mia Januario. Januario is the highest local seed, ranked second in the girls 200 IM. Nashua South should have a good showing, paced by Lucina Yi, while Merrimack’s Lauren Brennan and Alvirne’s Madison DeLaCruz are seeded in a few events. The boys meet is usually a competition between the likes of defending champion Hanover, and Oyster River, which saw the Marauders break its four-year reign. Individually, Milford’s Andrew Bartolomucci is the top seed in the 200 free and second in the 100 butterfly. Souhegan’s Lim Miles is third in the 100 free. In the girls event, Hanover, St. Thomas and Oyster River are the usual contenders, as locally it will be more of an individual event. Katelyn Rakiey of Campbell, Milford’s Elaine Danas, Souhegan’s Vivien Merryfield, Alexa Leary, Caroline Mastergeorge, and Bella Geskos (third 100 breast) Hollis Brookline’s Mary Martin and Maya Ruvido, and Wilton-Lyndeborough’s Ava Rondeau (second in the 100 breast) are among the locals to watch. Saturday is not just a big swim meet day. It’s also the day of the state gymnastics meet, with host Pinkerton the usual team title favorite and, of course, Bishop Guertin’s Cameryn Nichols the individual All-Around favorite. Her score last year was 37.4. There will be two sessions, the morning session beginning at 10 a.m.and the afternoon at 1 p.m.
As for team seeds, Pinkerton is No. 1, followed by Bedford (2), Londonderry (3), Pelham (4), Bishop Guertin (5) and Nashua South (6). They’ll compete in the afternoon sesson. The other local seeds competing in the morning session are Alvirne (14), Milford (15), Hollis Brookline (16) , Merrimack (17) and Nashua North (20). On Monday and Tuesday, local skiers will be competing in the state Division I and II Alpine boys and girls championships. Bedford appears to a favorite in Division I boys and girls, although Bishop Guertin comes in as the defending boys champ. Kennett is the defending Division II boys and girls champion, but Hollis Brookline, Milford and Souhegan will give it a go. Monday will be the Division I girls at Mount Sunapee and the Division II boys at Crotched Mountain. Tuesday is the Divison I boys meet at Mount Sundapee and the Division II girls at Pat’s Peak, all starting at 9 a.m. If you’re feeling nostalgic about high school girls basketball, then you will want to be at Alvirne’s C.J. Steckevicz Gym on Friday, Feb. 22. That’s when the school, prior to the Alvirne-Portsmouth game, will celebrate the 25th anniversary of the 1994 Class L girls basketball state championship team. 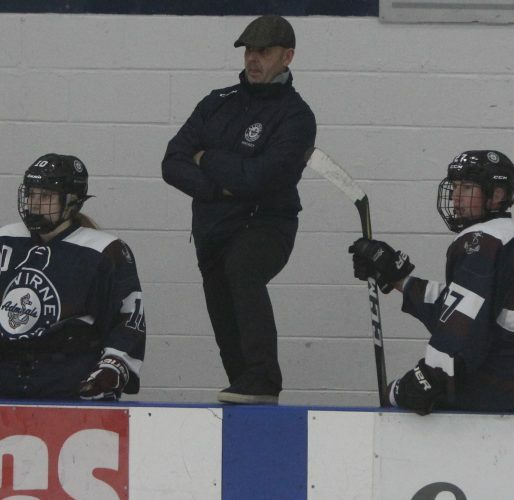 It’s likely that the coach of that team, Ken Johnson – the recently retired Merrimack principal – will attend. Johnson is currently an undergrad professor at High Point (N.C.) University. What was memorable about that season was Johnson guaranteed in a television interview that his upstart Broncos would win the crown, which they did in a tight 37-35 win over Concord. Once again this month, the Merrimack High School hockey team will hold a Military Appreciation Night on Saturday, Feb. 16, at 4:40 p.m. at West Side Arena in Manchester, with the Tomahawks facing Lebanon-Stevens-Mount Royal. All Merrimack players will be wearing jerseys honoring a service member, past or present. There will be a brief ceremony after the game honoring those service members. All proceeds from the game will go directly to the New England Warriors, an organization designed for rehabilitation of wounded, ill and injured service members and veterans, with sled hockey a main activity. All veterans and active duty service members will gain free admission.